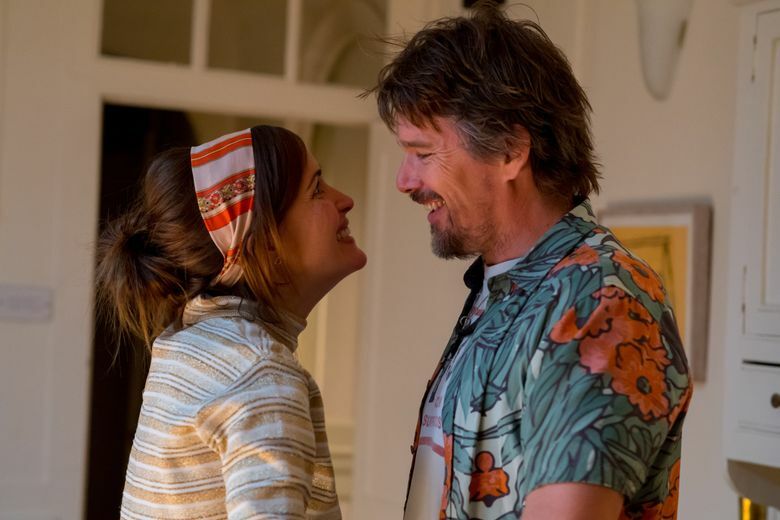 Based, somewhat loosely, on Nick Hornby’s charming novel, “Juliet, Naked” is pretty much everything you want in a rom-com, even if it's not quite distinctive enough to linger. Rating: 3 stars out of 4. “Juliet, Naked” is basically what would happen if you put “Almost Famous” and “You’ve Got Mail” in a blender and then poured the contents out in a picturesque English seaside town; none of which is a terrible idea. In the film, Annie (Rose Byrne) lives in said town, managing the local museum and wondering why the sparks have vanished — if they ever indeed existed — from her 15-year relationship with Duncan (Chris O’Dowd), a college professor and obsessive fan of now-reclusive American rock star Tucker Crowe (Ethan Hawke). Somewhat accidentally, Annie winds up writing Meg Ryan-ish emails to Tucker, unbeknownst to Duncan. Sparks, and a lot of incredulousness (on Duncan’s part), soon fly. You wonder how Annie, played with appealing vibrancy by Byrne, could have stuck with him so long, and you wonder about the neatness with which Tucker, for whom Hawke finds just the right note of tired handsomeness, finds his way into the mix. But you won’t worry about it too long; everything’s too pleasant for that — nice cast, sweet story, lovely scenery. “Juliet, Naked” won’t keep you up at night; nobody even gets naked (the title refers to an acoustic version of a song). But as rom-coms go, it’s pretty much everything you want, even if it’s not quite distinctive enough to linger. ★★★”Juliet, Naked,” with Rose Byrne, Chris O’Dowd, Ethan Hawke. Directed by Jesse Peretz, from a screenplay by Evgenia Peretz, Jim Taylor and Tamara Jenkins, based on the novel by Nick Hornby. 98 minutes. Rated R for language. Opens Aug. 31 at multiple theaters.